January 1, 2007. I spent the entire day knitting. Samwise enjoyed it, as well, as you can see. Yes, I stayed in my jammies all freakin' day. It was loverly. I was going to go join up with my knit-wit ladies . . . but I was feeling raspy in my chest and thought laying around in jammies sounded lots easier. I worked on several projects throughout the day, including my final (I think) pair of the Socks of Doom for Sock Wars. You can see the socks, knit from some soft gray stuff that was bought by another warrior and sent along to me. I only had to knit the second sock . . . but I finished my Christmas gifts before even casting on. I can't tell you how nice it is to no longer have that hanging over my head. For those of you who are wondering . . . no, I never received a pair of socks from this game. Ah well, it was a fun pattern, a quick knit. 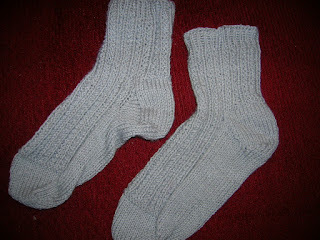 So well did I like the pattern that my FIL's socks were from it, as well. 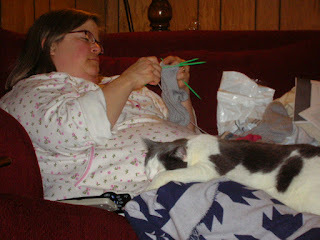 Sorry you missed our day of knitting with the Knitwits but spending a day in jammies and knitting sounds like HEAVEN!! You lucky girl.... hope your 'cold' is better. So sad to hear you didn't get a pair of socks. That's not nice of your person. Hope to see you Friday..